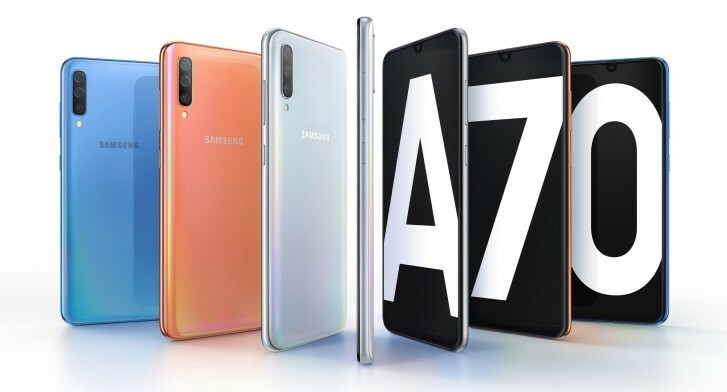 Samsung has officially launched Samsung Galaxy A70 smartphone. It comes with a 6.7-inch FHD+ Infinity-U Super AMOLED display powered by octa-core processor with 6GB of RAM and 128 GB of internal storage and comes with a microSD card slot for expanding the phone’s storage capacity. On Camera, it has a 32 MP primary sensor with an f/1.7 aperture, an 8 MP f/2.2 ultra-wide-angle camera,5 MP f/2.2 depth camera sensor and 32 MP f/2.0 selfie camera. It comes with scene optimizer that can identify up to 20 scenes and adjust the camera settings for the best output. Galaxy MA70 comes with an in-display fingerprint sensor for security and it works with Samsung Pass that can sign you into the apps and websites using the fingerprint sensor. It runs Android 9 Pie-based One UI on top. Connectivity options include Dual SIM, 4G VoLTE, Wi-Fi 802.11 b/g/n/ac (2.4GHz / 5GHz), Bluetooth, GPS, and USB Type-C port.packed by a 4500 mAh battery with 25W fast charging. Samsung Galaxy A70 comes in White, Blue and Black colors, is priced at Rs. 28990 and will be available for pre-order from between April 20 and April 30. Consumers who pre-book can purchase Samsung U Flex, Bluetooth headset worth Rs. 3,799 for Rs. 999. It will be available across all retail stores, Samsung e-Shop and Samsung Opera House as well as Flipkart from May 1st.